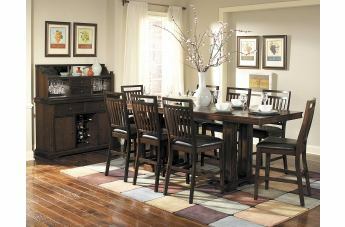 Create a casual feeling in your formal dining room with the classic Everett Collection by Homelegance. 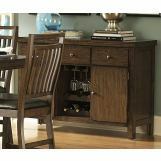 Arts and Crafts styling is used to add an air of tradition to this new dining concept. 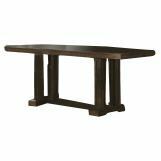 The gathering height table is 96 inches long allowing for the casual atmosphere created by counter height seating while still allowing for large groups to gather. 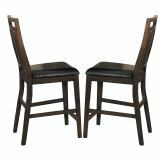 The dining group has trestle base table, warm cherry finish over oak veneers with bowtie inlay accents perfectly exemplifies the Arts and Crafts style of this new dining configuration. 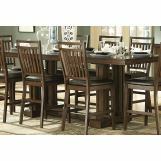 Also available in Medium Oak finish.